There wasn’t much that could get or keep Ruth Cain down. Ever determined and with ways all her own, she defined the meaning of devoted wife, dedicated mother, loyal friend and a woman devout in her faith. She was a blessing in the lives of many with her generous spirit and giving nature, and her warmhearted ways was an inspiration and gift to those who loved and cared for her. Quite talented in many respects, Ruth was a selfless woman who always thought of others. A fine example of her Christian faith, Ruth will be remembered with joy. Ruth was born at a time when America continued to recover from World War I and was straining to rebuild its economy. However, the nation’s can-do spirit was reflected in Charles Lindbergh’s solo flight across the ocean, Henry Ford’s mass production of the automobile, and the Suffrage Movement that won women the right to vote. Yet for Chester and Delta (Elburn) Van Dyke, nothing compared to the blessing of welcoming the birth of their little girl, Ruth Gertrude on August 18, 1923. Born in Grand Rapids, Michigan, Ruth’s family moved to the Indiana area for a time, remaining there during the tumultuous times of the Great Depression. Even so, Ruth enjoyed a childhood typical of her generation. Eventually Ruth and her family returned to her hometown of Grand Rapids where Ruth attended the local schools. She went on to graduate from Creston High School in 1941, and that very year she gave birth to her son, Larry Van Dyke. Before long, she met a handsome fellow named Orville Cain who had two strapping sons of his own. The couple dated for a while and in 1943 they shared vows of marriage. They set out to make a good life with their family in Comstock Park where they made their home. Orville worked as a radio repairman while Ruth worked outside the home as an inspector for business machines. Having a love for life, Ruth lived it to the fullest and then some throughout her days. At one point she was on a swim team of synchronized swimmers. When Ruth believed in something, she gave it her all. She liked following politics from her earliest years and as an adult she leaned towards the Republican Party. A staunch supporter of many causes, she collected pins from the many marches she attended and was involved in over the years. In fact, she even had a pin from an anti Hitler march she attended. Ruth was especially fond of dancing, and she was quite good at it, too. Whether fast or slow, ballroom or solo, Ruth loved it all. She particularly enjoyed dancing with her grandson, Mark whenever she had the opportunity. Blessed with a gift for singing, Ruth was a member of the Alpine Baptist Church choir and also sang in the group, The Silvertones. When it came to music, Ruth enjoyed the likes of Patsy Cline, Loretta Lynn, and gospel music. Travel was something else Ruth loved. She saw the sights traveling to Italy, France, Germany and Hawaii, and she spent time in Florida, as well. A woman who liked having a lot of fashion options, one of Ruth’s favorite places to shop was Goodwill where she enjoyed shopping for herself and others. She liked bowling and had been on a league at Westgate Bowling Alley where she bowled a perfect game. 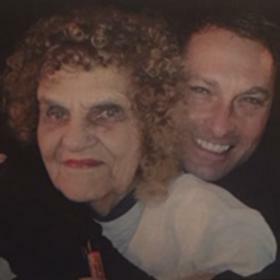 She loved Italian food and when dining out, The Olive Garden Restaurant was her favorite. Her love of cheesecake satisfied her sweet tooth, whether she made it herself or bought it at the store, as well as mint chocolate chip ice cream. She loved cats, and Zipper, her feline companion lived to be at Ruth’s side for 18 years. 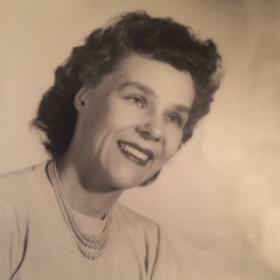 Ruth had the honor of being elected as President of the West Michigan Machinist Council, the first female ever to do so, and later would receive a 50 year award from the Council. She continued preparing taxes for the elderly as she had done for many years, and she volunteered for the church food truck. Most of her travels took place during her early retirement years, and spending time with family and friends always brought joy to Ruth’s life. When her beloved Orville passed away in the early 1990s, Ruth remained living on her own in their family home. In 2009, Ruth fell and broke her hip. Ever determined to dance again, she worked hard through two months of rehab and before long she was out on the dance floor again. In June of 2017, she broke her other hip and by Thanksgiving she was able to gingerly dance again. By Christmas she was even walking without the aid of a walker. 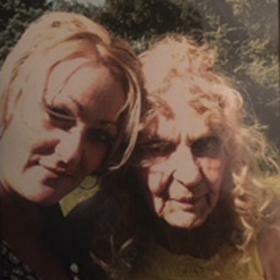 Sadly, Ruth suffered a stroke in March, but her determined spirit to leave the hospital and return to the comfort of her home where she longed to be for the remainder of her days was evident. There was no one quite like Ruth Cain. Through her determined spirit she persevered much, and with faith as her guide, she lived fully and completely at every opportunity. She gave of her time and talents, and her care and consideration for others was a testament to her unbridled faith. Although she will be deeply missed, the spirited nature of Ruth lives on in the hearts of those who knew and loved her. 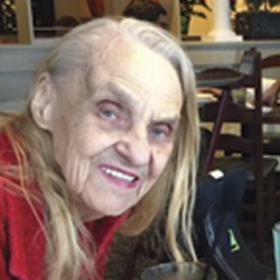 Ruth Gertrude Cain aged 94, of Grand Rapids, passed away on March 24, 2018. She was preceded in death by her husband, Orville; and son, Larry Van Dyke. 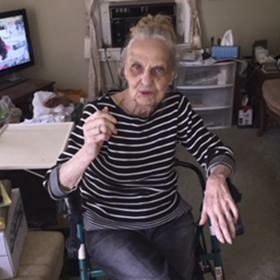 Ruth is survived by her daughter-in-law, Esther Van Dyke; grandchildren, Mark Van Dyke, Gregg Van Dyke, and Tammy (Thomas Kruger) Van Dyke; great-grandchildren, Keeghan Jackson, Azealya Jackson, Chance Van Dyke, Cammy Van Dyke, Morgan Van Dyke, Jordan Van Dyke, and Jaden Holliday. The Funeral Service will be held at 1:00 PM Thursday, March 29, 2018 at Heritage Life Story Funeral Home, 1833 Plainfield Ave NE. Family and Friends will visit together for one hour prior to the service. Contributions in her memory may be made to West Michigan Humane Society. Please visit www.lifestorynet.com to read Ruth’s life story, archive a memory, photo, or to sign her online guestbook.